Operation Infatuate (November 1-8, 1944) was the codename for the Allied liberation of Walcheren in the Second World War, a crucial phase in the battle for access to Antwerp. The Battle of Walcheren featured troops of many nationalities - British, French, Canadian, Dutch, Belgian and Norwegian. On October 11 the sea dykes Walcheren were bombed by Allied air forces, flooding the island. After heaving fighting, the Germans were driven out, and when Veere was liberated on 7th November 1944, it was by Scottish soldiers: the 6th and 7th Cameronians, the 5th Company of the Highland Light Infantry, the 1st Glasgow Higlanders, and men of the Royal Engineers and Royal Artillery. Commanding the Cameronians was C F Nason, who wrote on seeing Veere, 'what a terrible crime it would be to destroy this lovely old town with its historic connections with the wool trade of Scotland.' Fortunately for all concerned, the city survived the war virtually unharmed. Elsewhere on Walcheren were other Scottish units, including the Lothian Yeomen, King's Own Scottish Borderers, the Canadian Black Watch and the Calgary Highlanders. The German forces surrendered the day after Veere's liberation. The centre of this panel shows the climbing lion from the arms of Zeeland, which is not dissimilar to the Lion Rampant of the Scottish royal arms. 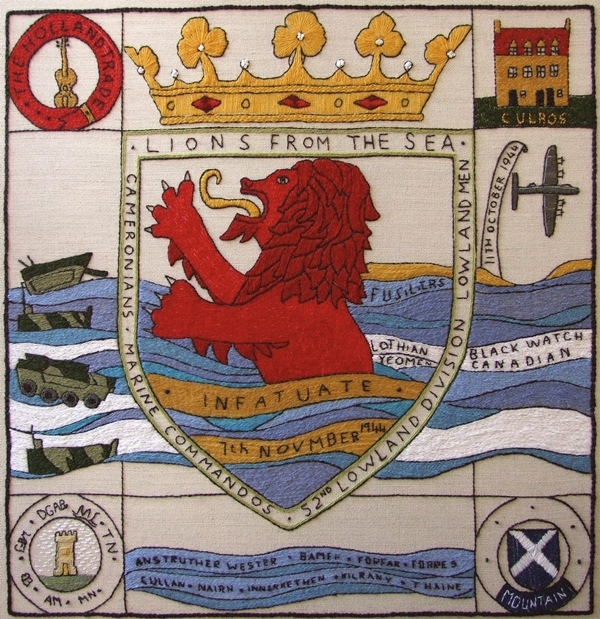 Surrounding the crest are references to the liberation of Veere and the region, whilst the "palace" of Culross features in the top corner, in memory of the strong trade links between Veere and that town. Other trading burghs mentioned are: Anstruther, Wester, Banff, Forfar, Forres, Cullan (Cullen), Nairn, Innerkethen (Inverkeithing), Kilrany (Kilrenny), Thaine (Tain). B’ e Gnìomhachd Infatuate (An t-Samhain 1–8, 1944) saoradh leis na Co-chòmhragaichean air Walcheren san Dàrna Cogadh Mòr. Anns a’ ghnìomhachd seo bha mòran shaighdearan de mhòran diofar nàiseantachdan – Breatannaich, Frangaich, Canàidianaich, Duitsich, Beilgich agus Nirribhigich – ach b’ iad na saighdearan Albannach a shaor Veere: na 6mh ’s na 7mh Camaròinianaich; an 5mh Companaidh, a’ Choisridh Aotrom Ghàidhealach; 1ad Gàidheil Ghlaschu; agus saighdearan nan Innleadairean Rìoghail agus a’ Ghunnraidh Rìoghail. Gu fortanach, fhuair Veere às le beagan damaist bhon chogadh. Bha aonadan Albannach eile a’ sabaid tarsainn Walcheren cuideachd, a’ gabhail a-steach Yeomen Lodainn, Saighdearan Crìochan Albannach an Rìgh, Freiceadan Dubh Chanada agus Gàidheil Chalgaraidh. Ghèill na feachdan Gearmailteach an latha as dèidh Veere a shaoradh.